I imagined my exposure spreading like a liquid stain across the back of my jet black jacket. 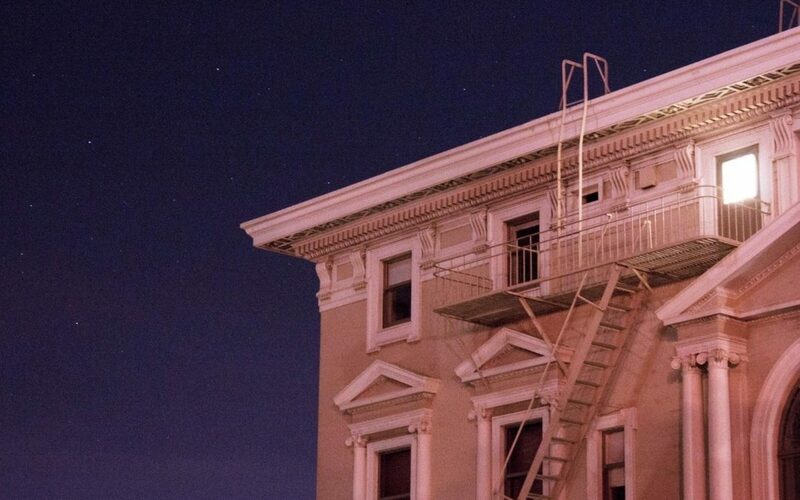 Pacific Heights is the kind of neighborhood where police are called without hesitation when a man in a dark coat is climbing a fence onto private property at night. The feeling of exposure was exhilarating in a familiar way but obscured by time and layers of blurry memories. That tasty reckless tingle which skips its way up your spine and shivers across your scalp in a chemical wave maniacally shaking each hair follicle as it washes along the skin. I had been waiting 2 weeks, since the first camera-less time I saw this image, to capture it. I knew I would be taking the risk of looking undignified, and childish if a squad car rolled up and I was there on the fence, one pant leg caught comically in the pointed top of a fence post. This type of thrill wouldn’t even have registered as exciting to me in the past. On the scale of adrenaline rushes that I had created, this barely infractionary trespass was laughably mundane but it held me under its weight and I felt obligated to it. Just a half hour before, at a dinner party, amidst a group of friends, people who I knew well but not intimately, I had, in a similar way, left myself emotionally exposed and so twice in one night I had decided to dismiss just a little of the heavy layer of protective insulating ash that I had agreeably let settle over me recently. At dinner, without permission, I had taken over the conversation, and vibe, of the party by launching into a spirited account of the current standing of my messy divorce and custody proceedings. Pretty much turning on the tap for a full on dinner party cold shower. My friends listened respectfully of course as they gently arranged their silverware or nodded their gracious willingness to stay engaged as I rambled on, fueled by the wine and months of pent up resentment. A table full of bobbing heads and teetering silverware.